This little tool may not look like much, but it sure is a handy combo! The brush end can be used for general machine cleaning and, surprisingly enough, the handle has a tiny hole for use to insert needles into your sewing machine. 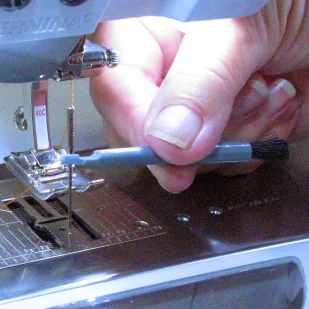 The needle insert is a fantastic help to get those small, thin needles in the right place. Perfect for pleasantly plump fingers, shaky or arthritic hands, or anyone who has difficulty getting a sewing machine needle properly placed.